Proteins fold according to a script written in the pattern of their amino acids. But to function properly, some parts must ad-lib. The active sites of enzymes, proteins that speed up and guide biochemical reactions, make life possible. To do this, their instructions have to conflict somewhat with the protein's overall structural plan, according to scientists at Rice University, the University of Buenos Aires and the European Molecular Biology Laboratory in Heidelberg, Germany. According to the researchers, evolution has selected parts of enzymes as being important enough to be allowed to energetically deviate from the instructions that lead to a folding funnel, which guides the proteins into their functional low-energy states. 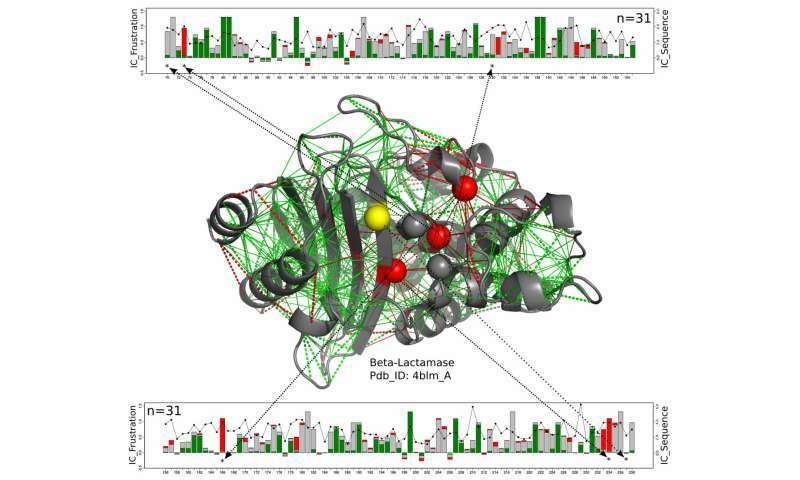 By surveying essentially all known enzymes, the researchers also confirmed the suspicion that additional levels of more weakly frustrated interactions surround and support the catalytic sites themselves. The theory detailed in the Proceedings of the National Academy of Sciences extends the accepted principle of minimal frustration that explains why proteins can smoothly progress from the linear sequences originally encoded in their DNA to their working, three-dimensional globular forms. This principle acknowledges the fact that frustration often goes unresolved when the remaining energetic conflict somehow serves the protein's function. According to Rice's Peter Wolynes, who enunciated the principle in mathematical form more than 20 years ago, the energy landscapes of proteins with catalytic parts are worth extra analysis, given the importance evolution has assigned them. "A perfectly folded molecule, no matter how beautiful as a sculpture, can't do much," he said. "You have to have a protein that, while being mostly folded, still has a few frustrated hinges that are incompatible with folding but are necessary to allow for the movement required for chemical reactions." Frustration at the atomic level is simple to experience: Just push the positive poles of two magnets together and feel how they push back. Like magnets, the amino acids of a folding protein attract and repel each other as they (mostly) resolve conflicts and finally come to form a stable arrangement of contacts. "Now add a third magnet, and you can encounter frustration that you can't get rid of," said co-author Wolynes, who worked with the Buenos Aires team led by biological chemist Diego Ferreiro, a former postdoctoral researcher in his group. The new study shows that frustration among the enzyme's neighboring amino acids, as in the situation with the third magnet, acts to help the frustrated enzyme stand its ground. It remains somewhat unstable but has regions available to bind with and modify target molecules. Clearly, Wolynes said, evolution has priorities that supersede the aesthetics of achieving a perfect fold. The research team computationally surveyed hundreds of known protein structures and discovered that entire families of enzymes share characteristic signatures of active-site frustration that extend to the second and third amino acid layers, or shells, around the enzyme. "The interesting thing we found was that frustration generally extends beyond the absolute first shell," he said. "That means there's an awkward but necessary subtlety to the functional constraints that requires getting these three shells right." Wolynes noted Nobel laureate Frances Arnold and others who study artificial evolution in the laboratory have seen evidence of extended frustration in their efforts to modify enzymes for novel reactions. "Sometimes they would specifically change the active site in order to catalyze different chemical reactions from the natural ones, but found that amino acids distant from the active site also needed to change to make the enzyme work efficiently," he said. "It wasn't obvious why, but the models show that changes in the second and third shells do improve enzymes' catalytic ability. "So our results were not a complete shock, but it's nice to see that extended frustration is quite prevalent in nature and is a common theme through all the known enzyme classes," he said. If I understand the article at all, it is saying that there are certain positions of the molecule where forces remain unresolved because of competition, and, that state is desirable to favilitate proteins working in ways they would not be able to work in if there was not that unresulved competition. That being said, there is no need to introduce "frustration" as a concept into the discussion. 'Frustration" implies desire unfulfilled. I'm not sure amino acids are capable of desire.